Chicken Cacciatore is a wonderful rustic Italian chicken dish chock full of vegetables, a thick, rich tomato based sauce and pieces of chicken all simmered together. The end result is a deliciously healthy yet decadent dish that the entire family will love. 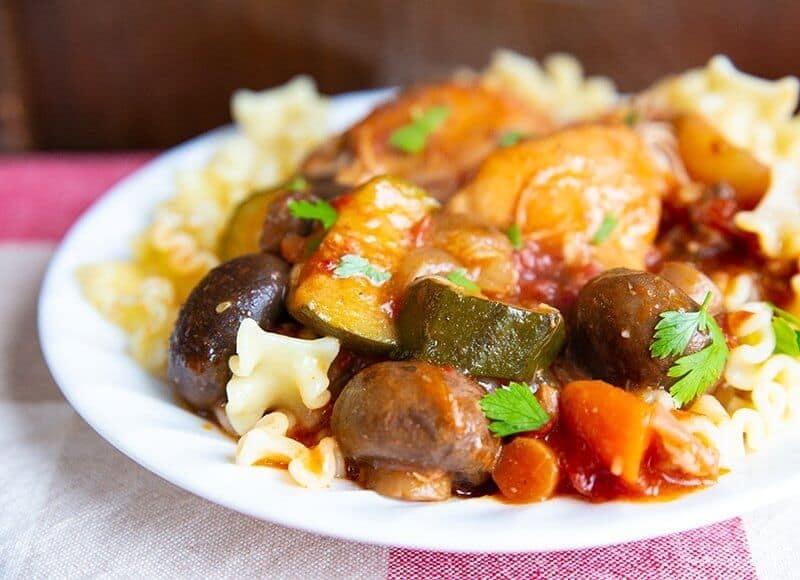 You can serve this slow cooker chicken cacciatore over rice or your favourite pasta, the choice is up to you. 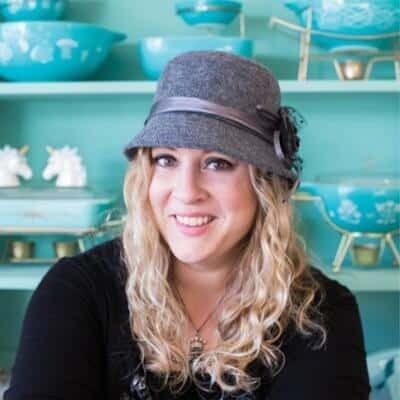 Chicken cacciatore is usually make in a skillet or braising pan on top of the stove, frying the chicken up first, removing it and cooking the vegetables in the fat. Following that, a can of tomatoes is added, along with red wine and the chicken is returned to the pan for a long, low simmer of around an hour. 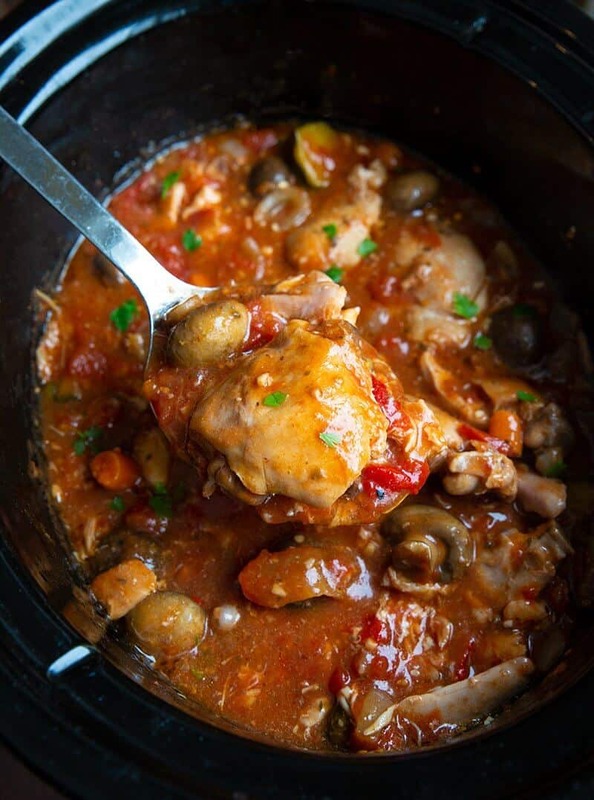 While it certainly is the traditional way of making chicken cacciatore, I wanted to make a slow cooker version that can low and slow cook all day and doesn’t have to be babysat on the stovetop. This worked like a charm and it’s because I use chicken thighs and not chicken breasts. I know everyone is always alll the rage about chicken breasts – and I do like them too! 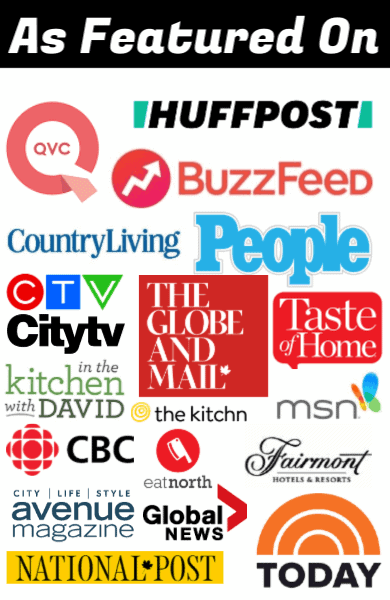 – but chicken thighs are where it’s at for slow cooking. I use tomato paste because the vegetables are going to release water, especially the mushrooms, It gets too soupy using another can of juicy tomatoes. I like a little bit of a thicker sauce. I have been known to use ketchup to thicken it up when I don’t have tomato paste and it works like a charm! Chicken cacciatore is usually made with SKIN ON chicken, so I usually leave the skin on and cook it that way. I am sure that the reason is the fat from the skin cooks into the dish, which makes it even richer. The choice is up to you, you can use skinless and boneless chicken thighs as well. You can play around with the types of vegetables and the amounts. My family doesn’t like too many peppers in it, so I use red peppers minimally in mine. Use chicken thighs. It’s just not as rich and rustic with chicken breast and chicken breasts really do dry out. The lovely thing about chicken thighs is they just fall apart instead of dry out when cooked like this, I would never use chicken breast in this recipe.Chicken thighs just get better and better the longer they cook, while chicken breasts dry out, even when they are cooking in a liquid. Now, this is not a true traditional chicken cacciatore and nor am I claiming it is, there are far more vegetables in my version than there is in the original. I love to use carrots in mine and to be honest you guys, the point of a good chicken cacciatore is to use up what you have on hand. Don’t be afraid to throw in what’s in your vegetable drawer in your fridge, it’s far better to not waste food than it is to be “original”! This dish has so many possibilities and that’s why it’s so popular, a true hunters dish, you use what you have on hand. I also LOVE zucchini in this dish, it holds up so well in the slow cooker! Don’t forget to PIN THIS RECIPE TO YOUR DINNERS BOARD and remember to FOLLOW ME ON PINTEREST! 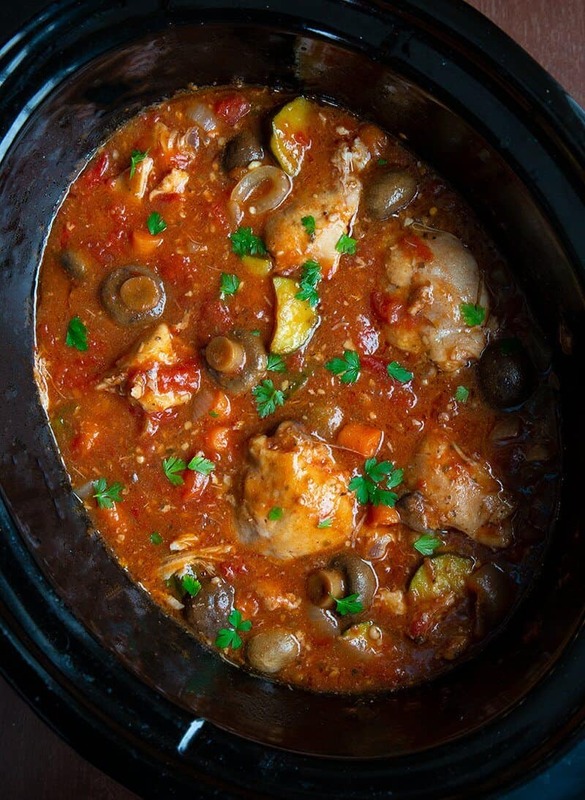 This Crock pot Chicken Cacciatore is a wonderful rustic Italian chicken dish chock full of vegetables, a thick, rich tomato based sauce and pieces of chicken all simmered together. The end result is a deliciously healthy yet decadent dish that the entire family will love. Combine everything but the chicken pieces in the slow cooker. Give it a taste. Want more red wine? Add more now. More stock for a salty taste? Go right ahead. Sample it now before you contaminate it with chicken. Place the chicken thighs on top, then press them into the middle of the sauce, making sure they are covered, but it's better that they don't touch the bottom and cook right in the middle. Then cover and cook! This took 4 hours in the slow cooker on high and will take all day (7-8 hours) in the slow cooker on low. This is the perfect meal to start in the morning when you head to work. If you leave out the sugar this recipe rings in at 13 grams of NET carbs per serving, making it a healthy low carb choice. This recipes is wonderful. Very flavorful. Veggie are an extra bonus. Enjoyed your chicken cacc recipe. When I saw Magpie in your heading, I knew you were Canadian.